in ALL caps: What Would Wil Wheaton Do? Sounds like a new version of the interwebs? I've been thinking about how I can help inALLcaps.com get some more eyeballs. I've been considering branding, marketing strategies, and bumper stickers. It all comes back to Wil Wheaton. He is an internet phenom. He is an actor and an author. He is one of the most popular bloggers/twitterers of all time. Not that I have any stats or anything to prove that, although he does have 61,158 followers on twitter. It just seems like wherever I turn, there he is. Obama's Secretary of Geek Culture. 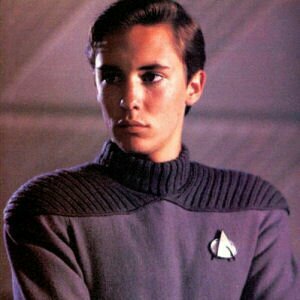 Wil Wheaton is best known for his role in the Star Trek:The Next Generation and the movie Stand By Me..
You do know who I am talking about right? The point is that if I could get Wil Wheaton to mention this blog...we will be known across the internet as geek approved. Which would be great not only because of the marketing coup it would be for the blog, but it would be a badge of honor being that I think Wil is very cool for being such a geek. I am a geek too, and proud of it! Wil often posts artists/songs that his iTunes Genius/Shuffle has selected for him. Well, he posts the conversations he has with his iTunes regarding the songs. I will post a few of the tracks he's mentioned and hopefully get him to mention us. I love Pink Floyd. It's not something I listen to often these days, but it was definitely the soundtrack to parts of my life that I look back fondly on today. One thing that drives me crazy though is hearing a Pink Floyd song in an iTunes shuffle. Why? well. There's something to hearing a Pink Floyd song among its siblings on the album. I like to listen to Dark Side from beginning to end. The Wall is just better when you listen to it in order. When I hear a Pink Floyd song alone, it just seems to be missing something, namely the next song in the album. The Bends follows Obscured by Clouds very nicely, if you were wondering about that sort of thing. This is followed by track three, "The National Anthem." This is when the first plane slams into the north tower at 470 mph. "The National Anthem" sounds a bit like a Morphine song. It's a completely different direction from the first two songs on Kid A, and it's confusing; it's chaotic. "What’s going on?" the lyrics ask. "What’s going on?" It gets crazier and crazier, until the second plane hits the second tower (at 9:03 A.M. in reality and at 3:42 in the song). Relisten to the album after reading this chapter, and that album will haunt you every time you hear it. Alright. How 'bout one more! iTunes: Psst...Maneater Me: [:whispers:] I know, right? iTunes: Are you going to dance around and sing it? Me: Maybe a little. Both: Squee! I am not gonna say anything disparaging about Hall and Oates. I'm into a lot of the same things Wil is into. I like Hall and Oates just fine. Dancing and singing...to Maneater... PASS. I did find it coincidental that a certain hot blonde I know experienced her first crush on Wil Wheaton. Of all the TigerBeat pinups, she chose Wil Wheaton. I always identified with Wil, but let me reiterate that I would never squee if Hall & Oates came on my iTunes. Maybe that's why she likes me more than Wil. Do Wil and me a solid, and buy the albums from the bands we mentioned above.